Increase machining efficiency with near-net shapes. Join dissimilar metals and unusual shapes. Enables joining of dissimilar materials normally not compatible for welding by other joining methods. Faster Turn-around Times – compared to the long lead time of forgings, which are currently 6 months or longer. Friction welding is a self-cleaning action that reduces or eliminates the additional energy or labor costs that are associated with surface prep. Joint preparation is non-critical as machined, sheared and saw-cut surfaces are friction weldable. Because no fumes are produced during friction welding, it is an environmentally-friendly joining solution. Friction welded joints have very reliable integrity. The final fused zone generally becomes stronger than either of the individual base materials. 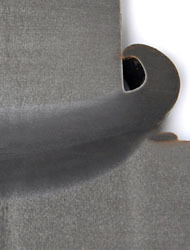 In the photo below, notice the “weld zone” in the cross-sectional cut of a friction welded part. It illustrates the properties of metallic bonds in friction welding. Does AFW understand the effect of heat in materials, so that pre-heating, cooling, stress relieving and other heat treat processes are properly applied? A weld zone that is properly treated to prevent stress risers, cracking, and to meet hardness requirements as you specify is absolutely necessary to your program.